The chord of C comprises of the notes C, E and G which also happen to be the top 3 strings on your ukulele (albeit in a slightly different order). If you were to play just those top 3 strings without hitting the bottom string, you’d be playing a C chord. You’ve just played a C chord without fretting a single note. The classic C chord which everyone learns first drops your third finger onto fret 3 of the bottom string on your ukulele. 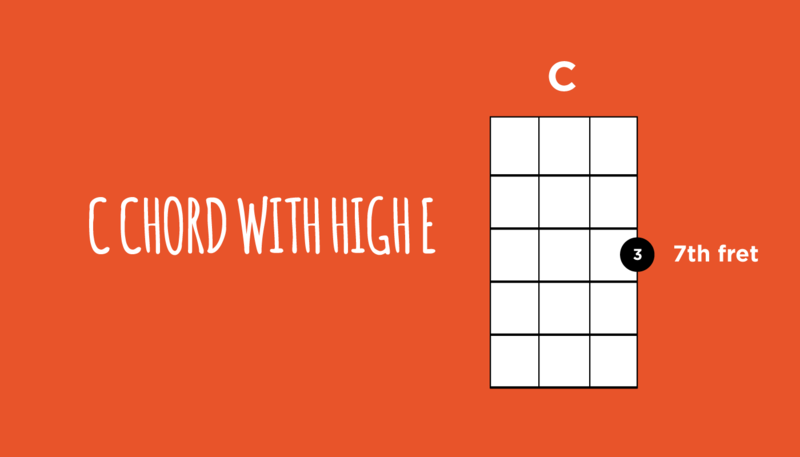 This note is a C. You’re effectively doubling up your C note when you play this chord. That’s 2 C notes and the additional G and E.
The reason I’m telling you all this is that you don’t need to play it that way. As long as you have the notes C, E and G you can play it any way you like. This time instead of doubling up our C note, we’re doubling the E note. Give it a strum and listen. Notice the subtle difference? That high E makes a really sweet sounding variation. You can throw this into your playing in place of the regular C chord that you normally play. Sometimes you’ll find it fits really well and adds a new dimension. Now let’s try another variation. We’re going to switch it up a little for this one. Drop your index finger on the 7th fret of C string. Place your second finger on the 7th fret of the A string and your third finger on the 8th fret of the C string. Leave the G (top) string unfretted. Essentially you’re playing a G chord shape at the 7th fret. Strum down and listen. You’re playing a C chord again, only again it has a different feel to it. There are many different inversions that form the same chord. It’s definitely worth spending at least some of your time getting to grips with them. A little fretboard knowledge goes a long way here. Check out my post on chord inversions if you’d like to know more. Love this tip. Needs practice to move in chord progressive, like going from G to this C to F.
Thanks Dave! Would you be willing to give us an example in a chord progression or song? Well Ally, they’re all just C chords so you can throw any of them in any song that uses a C. Give it a try! Thanks. Opened up my eyes.